Be the first to share your favorite memory, photo or story of Rene. This memorial page is dedicated for family, friends and future generations to celebrate the life of their loved one. Age 83 of Owosso passed away Sunday, November 4, 2018 at Memorial Healthcare. A Mass of Christian burial will be held 11am Friday, November 9, 2018 at St. Mark's Catholic Church of Goodrich with Fr. Andy Czajkowski officiating. Burial will take place at Great Lakes National Cemetery. The family will receive friends at Nelson-House Funeral Homes, Owosso Chapel on Wednesday from 6pm to 8pm and Thursday from 2pm to 8pm with a rosary prayed at 7pm. Rene was born April 21, 1935 in Fibre, the son of Rosario and Bernadette (Godin) Mayer. He graduated from Rudyard High School, class of 1953 and earned a Bachelor Degree from the University of Michigan in Business. Rene enjoyed ball room dancing, golfing, being a pilot and flying his own planes. He married Betty Meadows in Flint on January 3, 1959. Rene retired from General Motors as a supervisor after 30 years of service. After retirement he went into construction, building several structures throughout the State including many buildings for the Mass Transportation Authority in Flint. Rene is survived by his wife Betty; children Monique (William) Robinson, Cheryl Gamelin, Cindy (Greg) Richmond, Michael (Michelle) Mayer and Sheila (Don) Welch; 15 grandchildren Jennifer, Michelle, Jamie, Jerry, Jimmy, Danielle, Stephen, Elizabeth, Michelle, Rachel, Joseph, Michael, Joshua, Nicholas and Lindsay; numerous great-grandchildren; sisters Anita (Paul) Flynn and Beatrice Schlapkohl; other loving family and friends. He was predeceased by his parents, 4 brothers, and in-laws Raymond Gamelin Jr. and John Schlapkohl. Memorial contributions are suggested to St. Jude Children's Research Hospital or St. Mark's Catholic Church. To send flowers or a remembrance gift to the family of Rene U. Mayer, please visit our Tribute Store. 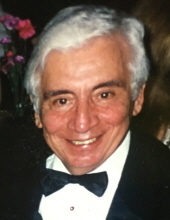 "Email Address" would like to share the life celebration of Rene U. Mayer. Click on the "link" to go to share a favorite memory or leave a condolence message for the family.